Innovation combines with superior cooling in Midea’s Combi Fridge to offer you an adaptable, energy saving addition to your kitchen and with a 295L capacity and a built-in water dispenser there is more than enough room for all your family’s needs. Kitchen layouts can be tricky; that’s why this Combi Fridge has a reversible door, so you can adapt it to open in a way that suits your layout best. Isn’t that nifty? 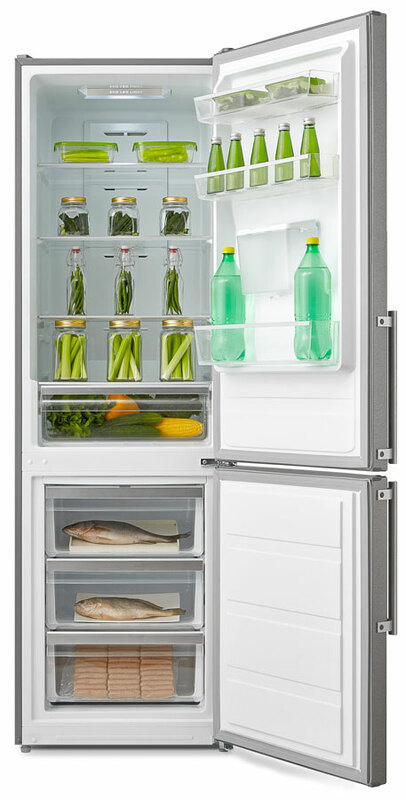 And with a fruit and veg crisping drawer, multi-air flow design and no frost technology, you won’t have to worry about manually defrosting your fridge, and everything will stay at an ideal temperature without transfer of odours to different sections. The stainless steel finish adds a modern touch to your kitchen while the built-in water dispenser ensures easy access to cold water whenever you need it. Energy efficiency is covered with an A+ rating, meaning you’ll save on electricity costs and help the environment.